I do not offer mass market giclée posters or large canvas transfers. Sorry. I like my work to be exclusive. However, I do make certain popular pieces available as postcards, greeting cards, mousepads, and any other promotional item that is smaller than the original and proportionally sized. Please see my deviantART prints page. Want to use one of my images on your website or page? I’m usually cool with that as long as I’m credited with a link back to my website. For print or reproduction rights, please contact me. I follow the CARFAC fee schedule. Want a painting exactly like a painting I have already sold? In some very rare circumstances—almost never because I prefer to do a fresh take on a scene—I may offer a reproduction of a signature piece. This reproduction will be a locally sourced canvas giclée print that I then completely repaint. Please note that if you see my work offered as a framed print or “hand-painted replica” anywhere other than the small prints I offer on deviant Art, it is not with my authorization and constitutes theft. Giclée (pronounced “zhee-clay”) prints are inkjet prints of a painting, usually on canvas or fine art paper. I repaint because mechanistic reproduction of my work isn’t as effective as I would like. 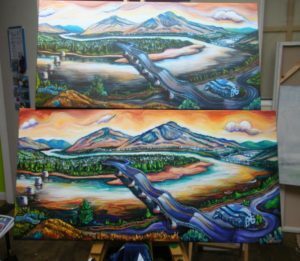 For example, my paintings are made up of many translucent layers and, as good as technology is, it doesn’t render the same lit-from-within neon brightness as one of my paintings. The dark colors on a print tend towards black rather than deep tones and there isn’t a way to replicate the light-reflective qualities of the luminescent or gilded paint I use. Moreover, digital processing tends to leave the picture a little fuzzy and, lastly, there just isn’t that same sense of texture on a giclée print as from brush on canvas. Fine points, perhaps. To my eye, the only problem is that giclées look like prints and not paintings. That’s not to say there aren’t perfectly beautiful prints out there, but if you’re buying an image in order to look upon it every day, it should be as beautiful as it can be. Mine are. Here is an example of a repainted giclée: the print on top is untouched, and the image on the bottom is completely repainted. HI there. 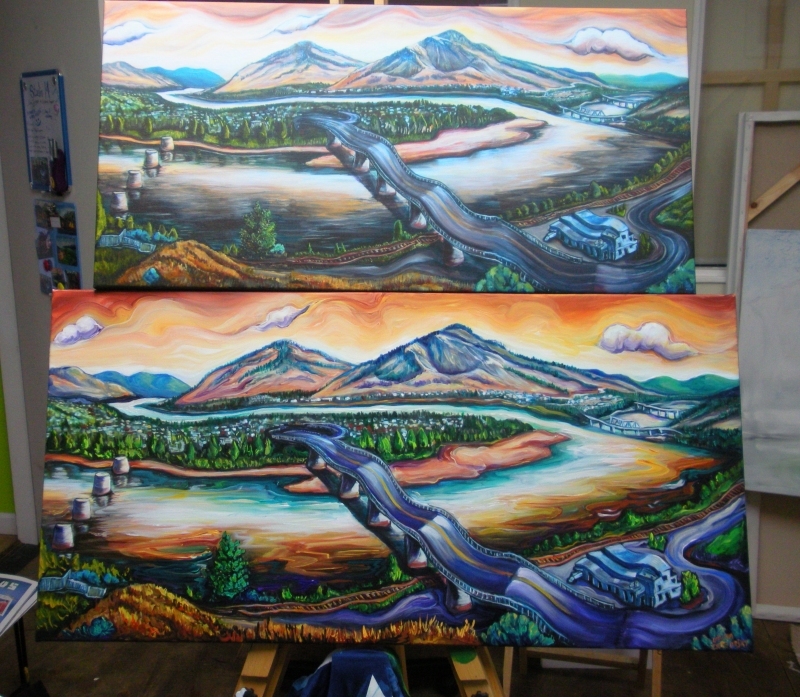 We are interested in the Calgary panoramic painting from sandy beach. Is there somewhere we can get a reproduction of this? Thanks! I am glad you like that one. I don’t do prints and reproductions, at least not in the traditional sense. Happy to discuss commissions. Please contact me via email. Thanks, and I will email when I have a poster. I should have something in the next week or so. Very interested in getting a copy of the offensive Vsmcour map…love it!! Please email mruryk@shaw.ca when available.